Man, this is weird, guys. Watching the pilot of Voyager is weird. I think I remember finishing Voyager sometime in October/November of 2013--which, now that I type those words I realize that's a year and two months ago--but it seems like I just watched Voyager. I feel like I was just hanging out with Seven and The Doctor and Tom and B'Elanna. And maybe that's why it feels so weird--because the most memorable stuff about this series just hasn't happened yet. It's weird to see Chakotay's crew in their Maquis getup. It's weird the way everyone says Chakotay--especially B'Elanna--another individual whose name no one can has any ability to get out consistently. It's weird how obviously they're trying to make Tom into another Riker/Kirk type when he ends up happily married in what seems like no time. It's weird how everyone treats the Doctor and how high Janeway's hair is. But it was fun, on New Year's--on a day that feels like such an optimistic beginning--to start this show all over again and to know how truly amazing it becomes. Watching it, I've already begun to miss Kes but look forward to Seven of Nine. I'm excited to watch The Doctor evolve and interested in the process by which Janeway goes from being like pretty much every other Starfleet (and Star Trek) captain to the matriarch of a close-knit, unbreakable, unsinkable family. I've seen Caretaker a few times over the years. But the first and most memorable time I saw it was the first time it aired. I was still a kid but I'd spent all the previous years of my life watching TNG. At the time Voyager aired, my life was fairly chaotic. My mom had re-married. I'd gone to live with my dad who, after years spent almost entirely with my mom, seemed a stranger to me. I had moved around four times in the four previous years and now I was in yet another new town and new school with new kids and new way of life. I felt adrift in a strange new place and I would have to buck up and make it work. And that's what the Voyager/Maquis crew decides to do here. I think, in January of 1995, that's exactly what I needed. I signed onto Janeway's crew that night and I never left. I was waxing nostalgic, big-time because in January of 1995 I was facing a cold, hard winter in a small city I'd moved to for employment that was 10 hours north of all of my family and friends. Voyager was my Saturday afternoon comfort. Watching Janeway and crew come together for the first time really brought back great memories. And though there are some token Trek moments that make me cringe (ie: the original first officer choosing to run across the bridge just as everyone's been warned "The wave is about to hit us, everyone brace for impact!") I forgive it so easily, not just because of the 20 years we've come through technologically and artistically, but because of the civility and optimism of the show in general. I miss watching "evolved" human beings that think before they speak, and ask the right questions and seek knowledge with open minds. We're just not living in that world, and I fear we may never. At any rate, I've always said my favourite Trek finale was "Endgame", and now I really believe I must give the distinction of best (most engaging) pilot to Voyager as well. "Caretaker", in a metaphorical sense has a very subtle, yet wonderful way of questioning the existence of "god" by comparison of our real-world societies, to the Ocampa's reliance on the Caretaker. It's philosophically very satisfying for me in a way that never occurred to me in the previous 3 or 4 times I've watched it. 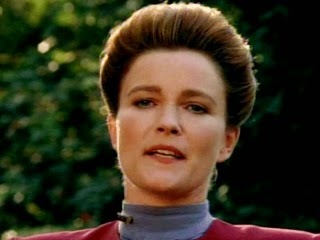 Otherwise the show also established Janeway as an incredibly formidable leader (in heart and mind). I fell in love with her character all over again when she met Harry Kim and told him "Ma'am" will "do in a crunch, but I prefer Captain". I fell in love with her character all over again when she spoke to Mark over the com and told him he "never bothered" her, except in ways she liked to be bothered, and wordlessly conveyed her love to him when he told her he'd already brought the dog bed to his apartment. (It reminded me, with subtlety that they really were expecting a short mission to the badlands and then home, rather than the separation they would suffer.) I fell in love with her character all over again when faced with a situation that was degrading by the minute in their favour, Janeway chose the well-being of a species she'd only just met over that of her own convenience. It really is a fantastic introduction. I've decided to re-watch Voyager along with you (I'll be on episode 3 tonight). But I had a thought about Caretaker - Tuvok said they could access and use the program which brought them to the Delta Quadrant but they were afraid of leaving the technology behind for the Kazon. Couldn't they have just used the program and beam the tri-cobalt devices onto the array and set them to detonate after a few minutes? Isn't this the same concept they used in Endgame where they used the Borg transwarp hub and then destroyed it? Anyway, I'm glad they didn't - the Voyager series is awesome!